I’m trying to go to the Farmer’s market each week so that the babes can walk around and see everything as well as, making sure that we eat as closely to the seasons as possible. This is part of my resolution to live more “in the now”. Of course I’ve given it a food oriented spin. 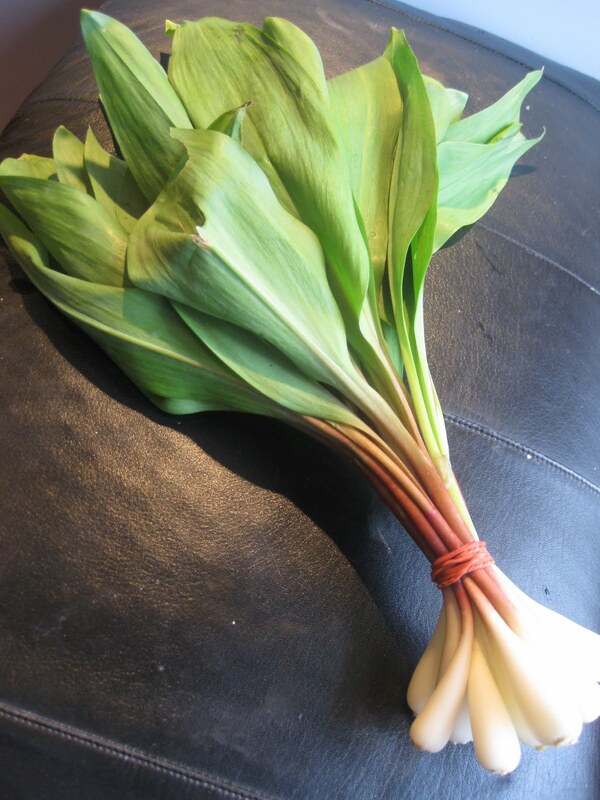 and garlic ramps. I LOVE these. The season is incredibly short (we sadly already missed fiddleheads) but if you ever see them snap them up. They taste like a cross between a leek and bulb of garlic. You use the white part and the stalk up to greens. I find the greens too bitter but they certainly wouldn’t hurt you. You’ll soon see garlic scapes that look like snakes with tight buds at the end. Can’t wait! I remember these from my childhood thrown into any number of dishes as the world came slowly out of hibernation but hadn’t seen them in years until I started to go to the “Main St. Market”. I rank them up with morels in my favourite wild food category. I hope to find some morels really soon for a very special mushrooms on toast. But what did I do with the ramps? I’ve made several things with my beautiful bunch including this delicious soup. I was doubly happy as it used my gorgeous ham bone from the other day and it was a really pleasing spring green amidst all of this grey. The day was really dull but this bright soup made a huge difference. 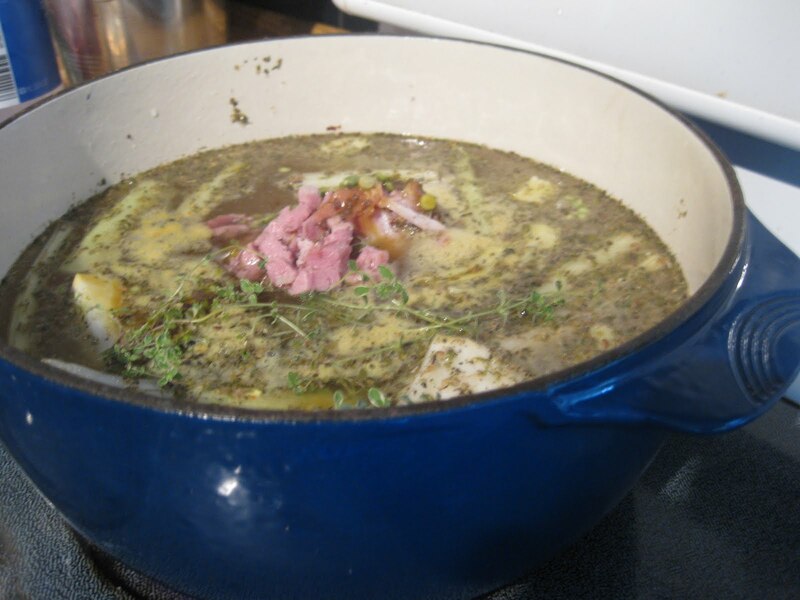 My father-in-law pegged it exactly right when he called this a pottage instead of a soup. Such an old fashioned but apropos word. Use the same roasting pan (and all the goodies left behind) as the ham. Pick as much of the meat off the bone as possible and place back into the pot. Add; 2 stalks of celery and 1 medium carrot cut into 1 inch chunks, three sprigs of thyme (or 1 tsp. dried), 1 med. onion (large dice) and 1/2 bunch of garlic ramps cut into the same size as the celery and carrots. 2 1/2 cups of dried, split green peas. Add enough water or chicken stalk to cover and simmer until the peas are soft but not mushy. About 45 minutes to an hour. Salt and pepper to taste. 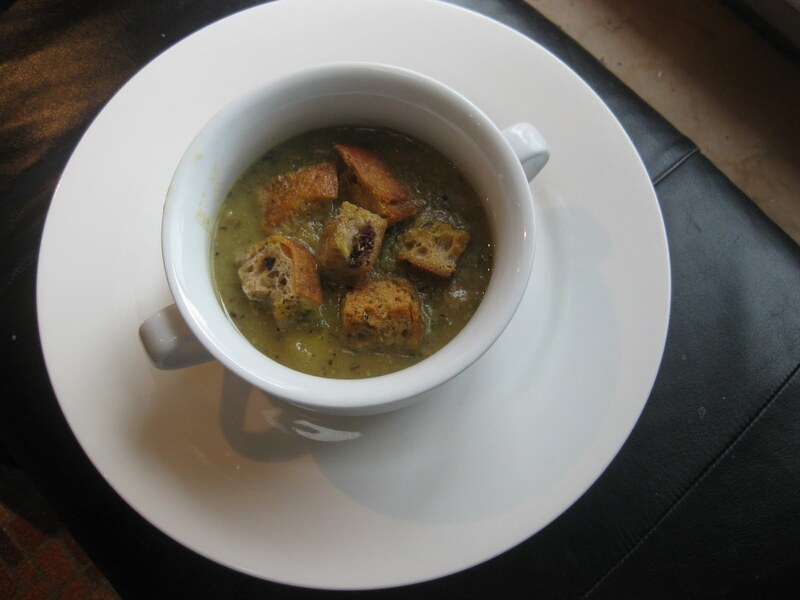 Serve with a few of the croutons from the other day and a nice chunk of pate.